I've taken a short position in the US Dollar early Monday morning. I observed an MACD divergence on the 60 minute price chart, and decided to take a short position in the September Dollar index contract. You can see the divergence has been forming since late last week, and in fact I did manage to sneak a small profitable short trade in there on Friday. 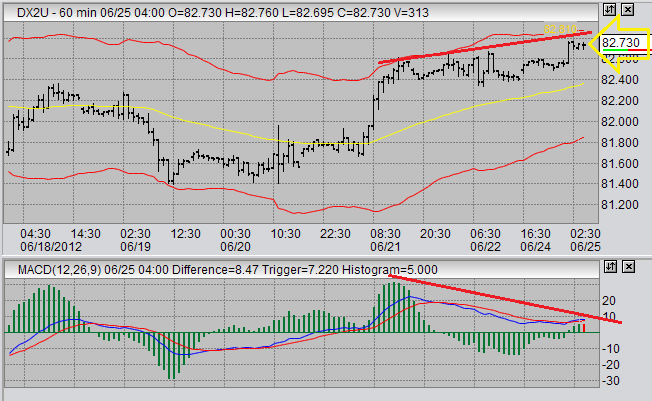 It looks like the divergence might complete itself and follow through today. Either that, or break and stop me out at a loss. Entry was made at 82.73 at 3:59 am. The trade is a short trade, and as always I'm using a safety stop loss just in case. I will be trailing the stop as the price moves in my favor. Here is a price chart for the September USDX contract in a 60 minute format. The futures trading chart demonstrates the MACD divergence, in both the histogram and moving averages, with red lines. My short entry is denoted with a yellow arrow. I'm at a loss to determine overal direction in the Dollar index right now. My inclination is to suspect it might start forming support maybe around 81 for a few weeks. We'll just have to see.